There's nothing more annoying than visiting a website and Flash videos or animations automatically running without your permission. 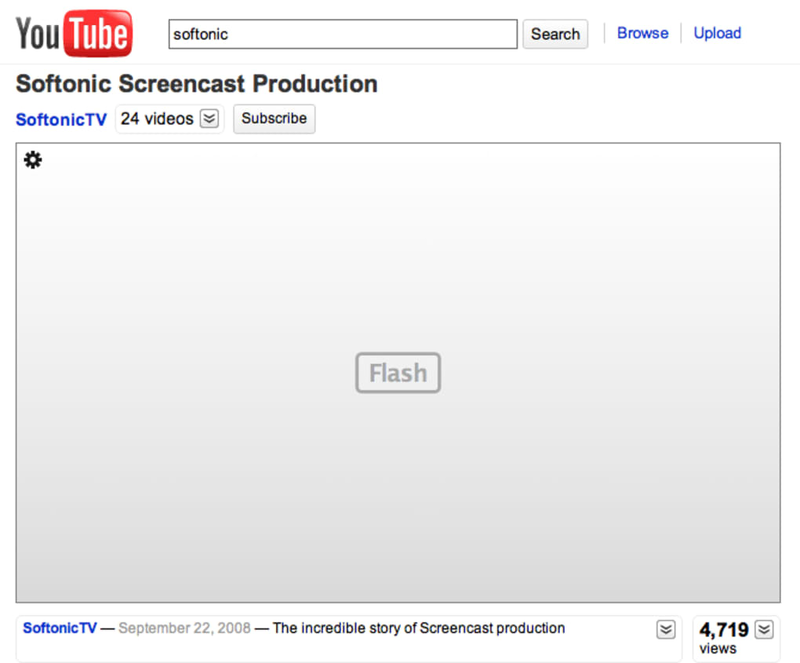 ClickToFlash allows you to select which Flash elements you want to watch or view in Safari. 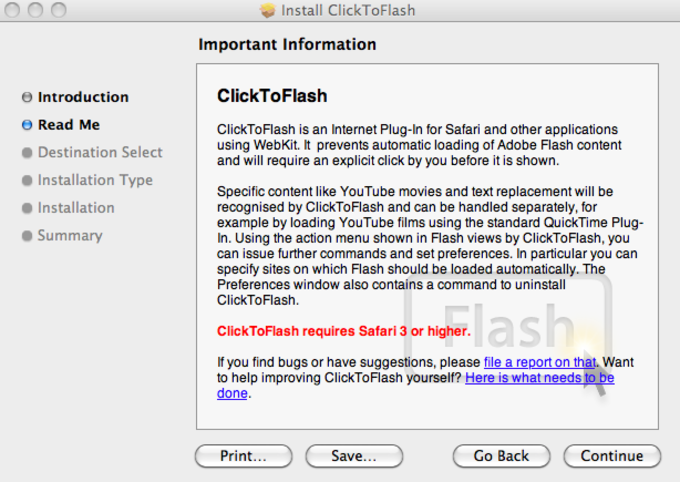 Flash sites and pop-ups are blocked by ClickToFlash until you click on the animation or video and give it permission to run. You can add sites that you want to grant permission to run Flash (such as YouTube for example) to a White List so that you don't have to block it all the time. To access the White List, you need to control click on an unloaded Flash box to access ClickToFlash's contextual menu. You'll then see options to add it to the White List, customize settings etc. It works with any webkit browser which for most people, will mean Safari. There are certain sites where it may not be effective - Flash ads within Mail banners may not be blocked for example but on the whole, it's very efficient. Most recently, ClickToFlash has been updated to block more Facebook videos and fixed a bug that made White Lists uneditable. 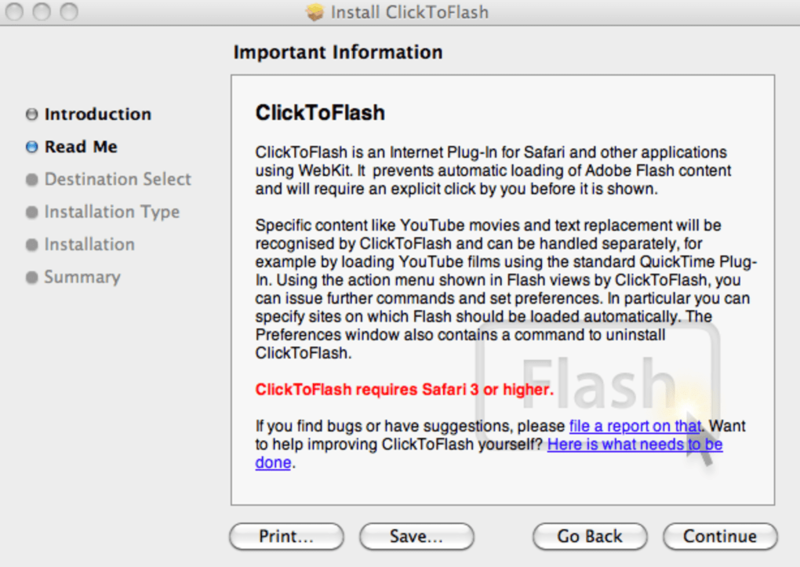 ClickToFlash is an essential add-on for any Safari user tired of the being plagued by Flash pop-ups, ads and videos. What do you think about ClickToFlash? Do you recommend it? Why?